Place your mixture on some non-stick parchment paper and fold closed. Wrap in some aluminium foil and bake in oven for 45 minutes. Would love to try the roast but need the recipe. In american measurements please..thank you for all the great recipes…!!! Anja, I love your recipes and videos. I make the oil free hummus the most! I was wondering if you ever made sprouted grain bread. Is it a vegan item? I’m used to measuring items in cups and teaspoons, etc. How do you measure these items that are listed in grams? Do you use a scale, or is there an easier way? This recipe looks so good, with easy to find ingredients! Thanks! I normally measure in cups too… but I had a lot of people wanting measurements. It is about 2 cups of beans and 1/2 cup rice. Just add more or less till you get a firm dough like consistency. Just watched the video of the gluten free seitan roast. I am excited to try it. I did see that the printed recipe does not list the 2 tablespoons of Tamari that you used in the video and wondered about that. I have added it in now 🙂 Thanks for letting me know. Tori I made mine last night and loved it!! Is there an alternative for vegetable stock powder in the Gluten Free Seitan Roast? A bit of salt, garlic powder, onion powder and mixed herbs. I can’t find the print option on your page for just the recipe. Thanks for the great recipes. Do you think this would work in an electric pressure cooker? I don’t think it would be the same. Do you think this would make a good Wellington? I’d like to try it that way. Also would be good with lentils. Can you tell me what is tamari? What would be a good substitute for tamari? Give it a try as a Wellington and let me know how you go 🙂 Tamari is gluten free soy sauce. My brother, wife and I loved the Seitan! How can you make it moister? Also, can you recommend a sauce or condiment for the Seitan. Can you cook it in sauce? I purchased commercial Seitan with no oil from Rainbow Grocery in San Francisco, California, U.S.A. and it tasted like rubber. You recipe is better!!!!!!!!!!!! It would not hold the same. It would also have quite a gluggy texture. Is there anything I could substitute the flours for? I haven’t tried any other flours… possible oat flour. You’re awesome and so are your recipes. I am 13 years old and I have almost been vegan for 1 year. This will be my first vegan Christmas so I wanted to make this. Can I just use rice flour for both flour portions? Or can I use oat flour for the chickpea flour ? Hi Paris, well done on being vegan for almost a year! This christmas should be fun for you 🙂 Chickpea flour really helps to bind this, however, oat flour may work too. I haven’t tried it though. I would not use all rice flour. It should do but I haven’t tried. Just use any conversion calculator on the internet. can I use gluten free flour instead of rice flour? What sort of beans are need for this recipe? Hi Ines, I am responding to what you said about the name of the recipe being misleading. Being vegan and GF is sort of tough in that it’s hard to find meat substitutes that don’t contain gluten. 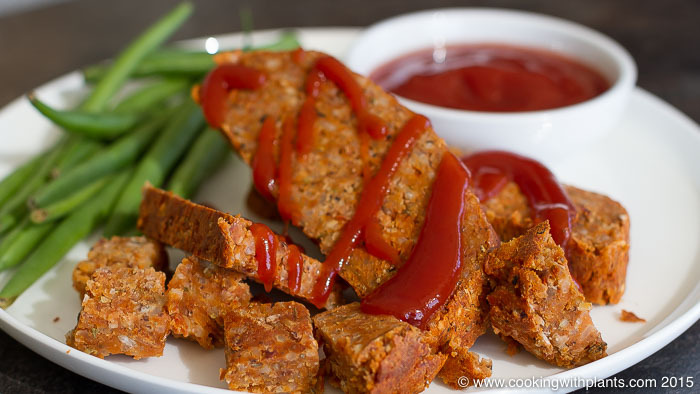 I was actually pleasantly surprised to see how many GF Seitan recipes were on the internet. That may be why she named it that. I am truly not trying to give you a hard time, I just wanted you to know there are a lot of different vantage points in the ______-free diet world. I do get where you are coming from though. Calling it gluten free seitan makes it easy for someone with coeliac disease to find a suitable vegan seitan substitute. Really looking forward to trying this as my 5yr old doesn’t like beans or lentils unless they are disguised. Is there an alternative to using foil? We try not to use it in our household. i am so making this tomorrow for supper .. i have tried many of ur recipes and they don’t disappoint. can’t wait for the new french toast recipe.i love french toast..you make it so easy for me to stay on my plant based program..thanks ever so much. love youryoutube channel & recioes. have yet to try tgem out, need to stock up on ingredients! How did this recipe get the name Seitan Roast? I thought seitan was the protein portion of wheat after all the gluten was washed away. Just a curious question. It is a delicious recipe no matter what you call it! It helps people to understand what the texture will be like and also people transitioning to a vegan diet search for gluten free alternatives so it helps them to find a suitable substitute. Anja, you are the BEST. You are classy Lady. Keep up your healthy ,plant base cooking for humanity.Make something interesting with raw fruits and veggies. OMG, I can’t believe how many folk are on the internet, yet can’t use said internet to convert weights and measures in a recipe. Can you lave out the tamari or use something else? You could use some salted vegetable stock instead, or soy sauce. Has anyone tried this with BBQ sauce yet? I want to use this recipe and make vegan ribz. Can you cook this without using aluminum foil? I am not a fan of using aluminum foil. Can you cook this in a dutch oven with some vegi broth or water instead of wrapping it up like I make seitan coned beef ? Or will it fall apart? I haven’t tried. It would need some experimentation. Oops! What is vegetable stock powder? Thanks Anja! Can’t wait to try it. Aloha and Mahalo from Hawaii. I love your blouse! Am 60 years old and just now watched Forks over Knives and What the Health….my husband and I doing a huge 180 from the Keto diet we have been believing in and following since last January. Talk about jumping the fence. Your recipes have made all the difference. Spend a lot of time online digging around and will order your cook books for Xmas and loving every single thing we have made of yours already! Thanks for bringing us to such an easy transition. Even my meat eating hunk of a husband luvs your recipes! Hi Anja. Is it possible to make the raw mixture a day ahead of actually baking? Can’t wait to try this! I’m glad you called it “gluten free seitan roast” as matched my search perfectly, as I was looking for a seitan type consistency without the gluten.. I’m also happy you used the measurements you did. I usually have to work out through calculation. The video is great too…clarifies everything in the recipe. It looks absolutely fantastic. I’ll let you know how it goes :-). Definitely looking at your book now …Thank you! So glad you like the recipe and that it is what you were looking for. Enjoy! I have been vegan for just two months, and am doing fairly well, (thank heavens for you tube!) but I recently realized my yearly corned beef feast is now a thing of the past, and have been searching for substitutes. Trouble is, everything I keep finding is full of gluten and Im GF. Do you think that this might work as a substitute? Im afraid it might fall apart in the boil. Do you have any other suggestions? – thank you!!!!! Diana, if you wrap it up tight in layers of cling wrap I would say it should hold together just fine while boiling 😉 I would also turn half way through. This looks delicious. I will be making this today. Thanks Anja. Hi Anja, this looks amazing and I can’t wait to make it!! I was wanting to make buffalo wings with it, do you think the tomato paste would alter the flavor at all? Hi Anja, I made this last week and it was a hit! I want to master the seitan and continue to make use of the ingredients I purchased for the recipe. Do you think this recipe would be good chopped or as pepper steak? I’m so glad you like it. Yes I think it will be perfect chopped or as a pepper steak. Enjoy!